Jewelry boxes make thoughtful gifts to be enjoyed for a lifetime. The right one for you is here, from mini-cases to large armoires! 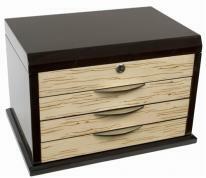 14" x 10 1/2" x 10 1/4"
Shop quality wood, leather and musical jewelry boxes from the best brands! 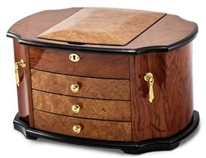 Choose from wooden boxes, leather cases, travel organizers, locking designs, music boxes, watch valets, floor standing armoires, ballerina boxes & more. If you're looking for the perfect gift, a jewelry box can be a thoughtful and unique choice. Our quality cases keep your valuables organized and protected to help ensure a lifetime of use. For assistance in selecting, contact us by phone or email, we're here to help! 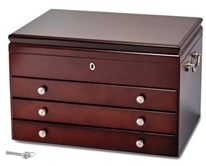 We stand behind all our jewelry boxes with easy returns and warranties!